Everything you do in your business sends out a message. Not just to your customers, but to your team too. We all know the importance of being a role model to our team. How we behave towards customers naturally sets the tone for how our team behave towards customers. It’s not just our daily interaction with customers, but how we regard them in general. Bad mouthing or criticising a customer in their absence will certainly send the message that it’s OK to be rude about customers, or even that customers are a nuisance or interruption to our job, rather than the very reason the job exists. How highly you value customers is also communicated through your systems and practices. To what extent are you prepared to put yourself out for the benefit of a customer? What really frustrates me is when I see businesses where the powers that be clearly see themselves as being far more important than the customer. If you play golf I’m sure you’ll know what I mean when you see all the plum parking spaces immediately outside the clubhouse being reserved for the committee. Or in corporate offices were there are 3 or 4 empty parking spaces immediately outside the front door reserved for the chief executive and his/her entourage, while visitors have to park way way down the car park (if they can find a parking space at all that is!). Just as insulting is when management park in disabled bays. Just what sort of message does that convey to a customer, and in turn what message does that convey to your team about the importance you place on customers? It goes far beyond just parking spaces. Simple things such as interrupting a member of staff who is talking to a customer without so much as acknowledging the customer; not trusting team members by delegating authority to do what they think is best for the customer; blaming the customer or quibbling over minor customer disputes. All these send the message we put ourselves before the customer. We are all familiar with the mood Hoovers; you know – those days when you come into work full of the joys of spring, and someone comments dryly “what are you so flipping happy about”, sucking all that energy and enthusiasm from you like a Hoover. Our physiology certainly influences our feelings and the feelings of people around us. In other words if we mooch around all day with shoulders dropped, hands in pockets, expressionless with our head down we’re far more likely to elicit negative emotions, than if we’re smiling, making eye contact and making gestures. The golden rule is treat others how you would wish to be treated. And that’s certainly a good start. But the platinum rule is treat others how they wish to be treated. Whenever I hear of managers or business owners complaining about lack of enthusiasm or engagement from their team (which of course is critical if you’re to give customers good service) I like to look at how they are treated by management, and what if anything they are doing to dampen their enthusiasm. When I ask managers what’s important to their team members it’s usually quite revealing when I get an all too common response of “money and a quiet life”, or “I don’t know”. The former might sometimes be the case but sadly it’s often an assumption. The only reason managers don’t understand this is because they never asked the question. Spending time with team members and finding out what’s important to them is just as important as your team spending time with customers, finding out what’s important to them. When you leave the ‘office’ you don’t suddenly become a different person. In the eyes of your team and your customer you still represent your business. So how any of us behave in the supermarket car park when someone pinches our parking space, or on the dancefloor at the Christmas party, or what we post on social media will still reflect on us, our values and what we see as acceptable behaviour. This doesn’t mean to say we can never let our hair down or show our personality; it just means remembering everything we do sends a message. 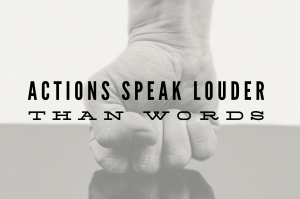 These actions will speak far louder than any words. This entry was posted in Employee Engagement, Leadership & Management and tagged employee engagement, Employee leadership on March 29, 2016 by Caroline Cooper. That was one of my favorites ever and SO true. Keep up the great thoughts.